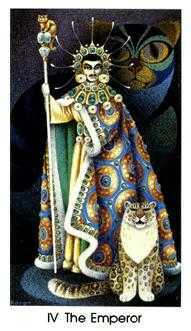 Karen Kuykendall, the creator of the Tarot of the Cat People, is called by people who know her, “the Cat Lady”. Her art has been influenced not only be felines, but also by architecture, anthropology, art history, costume in history, her travels in Europe, Mexico and the United States, and especially by the location of her present home, the desert of Arizona. The varied list of accomplishments from Kuykendall’s career reflects her ever-expansive creativity. In the late 1950s she developed for Jamestown Lounge Furniture Company of New York a line of medieval inspired furniture which is still illustrated in their catalog. For nine years, she taught in Arizona public schools, and she has taught extension courses at Central Arizona College and the University of Arizona. She has judged numerous art shows in the Southwest and was chairperson of the 1977 Casa Grande Art Fiesta. Her paintings hang in homes all over the United States, and her works, including papier mâché sculpture, have been shown in arts and crafts shows throughout Arizona. Her works have also been shown at the Phoenix Art Museum and the Tucson Art Museum. In 1965 and 1966, Kuykendall was the only female editorial cartoonist in the United States, when she worked at the Casa Grande Dispatch. Her book Art and Design in Paper Mâché was published in 1968 by Hearthside Press, New York. 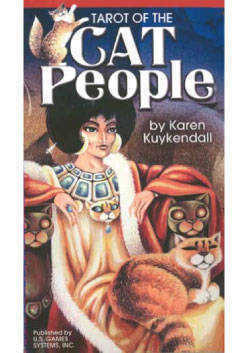 She also wrote and published Cat People and Karen’s Cats, written about and illustrated with her own cats. 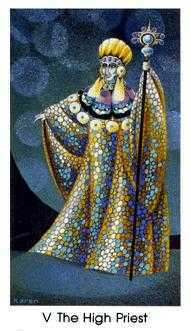 Presently Karen Kuykendall continues to paint and to create a line of papier mâché jewelry similar to that seen on the figures in the Tarot of the Cat People. 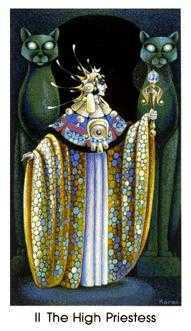 She appears at science fiction conventions dressed in the rich, flowing costumes and elegant jewelry of the Cat People. Her favorite subjects for art are richly costumed people, fantasy and science fiction, equestrians and of course cats, modeled on the ten cats that keep her company in her desert home while she works. 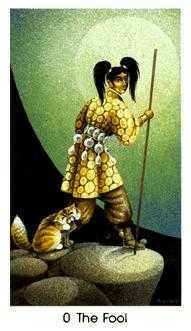 The artist devoted more than two years to the preparation of the original art for the Tarot of the Cat People. 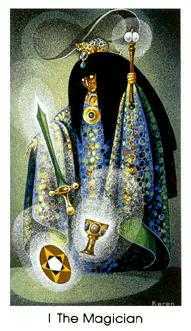 Each original card was painted in acrylic on board measuring nine and a half inches by fifteen and a half inches. With great skill and control, the artist “splattered” the backgrounds, using a toothbrush. 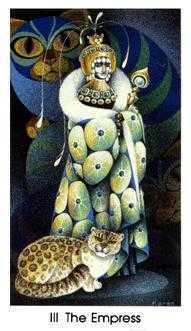 The stunning figures and felines are set in the world of the Outer Regions. U.S. Games Systems is proud to publish this outstanding Tarot deck, which successfully blends the symbolism of the Tarot with the fascinating imagery of science fiction and fantasy.